I personally like TAR15 intro and Israel Intro, which one do you guys like? I've posted all the intros I can find please vote for the one you like! TAR Classic's Intro was unique. It's the only one where Phil overvoices an intro that, in many ways, I wish they had kept using. I like the remixed of the theme (needed some change), but I hate how they don't update the intros anymore. They should at least put some pictures of the places they visit! However, they still have pictures of the racers doing tasks (it's updated every 3 episodes). Phil's overvoice would not work with the current intro, sadly. Jerry, what you posted did not have Phil's voiceover. Only reason why I went and searched for a You Tube clip that had it. I posted a link to that video and Peach kindly reposted that as an embedded video since that's a coding I don't know. if you would like to compare TAR14's to TAR15's.... go to Youtube and see it... you'll see that all teams will be introduced through the images fading, not cameras quickly sliding compared to TAR15's. Anyone know why they got rid of the voice-over? Having it for every episode might be a little excessive, but I think having it on each season premier would've been neat. I'm looking for the Asia Season 3 intro. Absolutely love that they've reinstated race footage into the intro, but it doesn't have that epic an impact if they keep reusing the same formula of 'race scene + scene at home' - change it up a little like in Season 1, and throw in a couple more scenes to speed up the action! ...and it gave away lots of spoilers. Did anyone not realise that the TAR1 video without the voiceover in the first post was posted by me? #1 Ann and Diane's dance move which almost synchronizes with the music, lmao! #3 Teri and Ian's robotic TAR3 head-turn, priceless! And i love TARA 2's intro too, because there's a Singapore Airlines plane right at the start. Too good. Kynt and Vyxsin had the best head snap I've seen out of all the teams. I'm glad that you pointed out the use of fades. It's one of the reasons that I prefer TAR14's intro to TAR15's intro. After re-watching all of the intros, I think that the panning started with TAR3. TAR2 used fades for some teams and I didn't notice any of the typical panning in it. I think TAR7 is pretty good because they only pan from top to bottom, either vertically or diagonally. I don't like it when they pan horizontally or from the bottom up, like most of TAR15. I like Seasons 1- 7's intros the best, once they changed the beginning, it didn't seem the same, but TAR 14 had a good one, but I don't like how TAR15 just used recycled images. I finally had a chance to go back to the season 1 DVD to transcribe the subtitles of Phil's voiceover. You know how many words would have needed to be changed for most of the subsequwnt seasons? It’s the most daring competition ever attempted. Eleven two-person teams, bound by friendship, love or family, will race around the world. They have no idea where they are going, what dangers they may encounter, or how the journey will affect their lives. Most of the teams will be eliminated, but the team that reaches the finish line first will win a cash prize of one million dollars. This is a race like no other in history. This is The Amazing Race. One. Change "attempted" to "conducted" and you've got it. And four of the other five seasons would have needed "twelve" instead of "eleven." It explaina everything a new viewer would have needed to know. And that is why I wish it had been kept in the intro. Teri & Ian + Susan & Patrick's eerie headturns/headshots FTW. Has anyone ever tried watching two of them at the same time, muting the sound on one so you can have a newer intro that still has the voiceover? I highly recommend it. Then, when you are done with that, go and watch the old season intros (pre-14) with the remixed music. It is also fun! 14 was all recycled too, broke our hearts...the Intro scrrencaps used to be the most fun part ever! Yes, but at least it had SOME new stuff! At least it's just generic B-roll stuff. Someday, some future season, they'll probably throw in some red herring just to waste our time. can you say Taku Drum? I love all the TAR intros They maybe different, but they all get me in the mood for the show! I didn't see TAR Israel's intro before and I think its quite awesome. The music, with those voices, is kinda like survivor. Umm...I dunno which one to vote for! This music needs to come back to introduce the episode. It's epic and it makes for a great lead in into the intro. Currently, the music sounds frenzied. Yes! Bring Redemptor back! I still don't know why they got rid of it, but it sure is ugly sounding now. I liked the "let's change the intro shots every once in a while" thing they had going on in 14...too bad they let it go on 15. That is priceless! Even my family members who never watch the show just love seeing that! That was terrible. I think they started with the intention of doing it the whole season (hence why Brian & Ericka and Garrett & Jessica actually had race clips) but then they got lazy and decided not to. It was horrid. At least they brought Redemption back. Well, sort of (plus it's a better fit in the beginning of non-premiere episodes). Wow, though comments. It's not that bad! Israel's intro is my favorite. It is so epic. 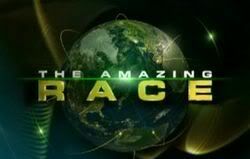 <3 And amazing, so it relates to the 'Amazing' Race. Israel has the best remix. The best montage is the TAR 2-13 intro. The intro wasn't great, but the very beginning was cool with the new music. But if the intro does the thing they did in TAR 14, then I will forgive it. Really? Where? I thought I heard the low, frantic music in the preview. But Redemption is the show's most memorable tune, after the main theme itself. It was played when they first showed the bus with all the teams on it. Right before Brent & Caite were introduced. I have to say that I always laugh at Don & Mary Jean's slow, inclinated head turn sparkling love and blinking like a Disney princess; Hannah and Margalit "welcome to the circus! "-esque scene and Dan & Jordan extremely frozen faces, but everybody is right: Terri & Ian's exorcist headspin is just hilarious!! From my opinion, the best team scene is Maria&Tiffany, with the focus on the chips fading fastly to their evil, but brave pokerfaces in the background. What was it? It changed after Leg 4, but why? I noticed that. In the first episodes is a cementery and later becomes the bockground becomes in a train moving? The best was Joe & Bill's toast to evil in TAR1. Loved that. And then it came back for All-Stars. Why my season intro isn't included on the list? Don't like this new intro. Especially seeing as they've whizzed past Steve and Allie, and they've chosen the saddest moment of the race so far to represent Joe and Heidi.